Selling Medicare Supplement insurance is easier when you learn from top sales pros filmed at our national conferences. For agents and brokers who want to start selling — or sell MORE Medicare insurance solutions. TAKE ADVANTAGE OF THE LIMITED TIME $60 SAVINGS OFFER (details below). Watch on any device with Internet access. See information and the titles for all available videos – click this link now. You will see a link to gives you access to see the session titles and length before deciding if you’d like to order access. We filmed sessions at National Medicare Supplement Sales Summits. You’ll watch the speaker and see their power points. Learn from the nation’s top Medicare Supplement agents and industry experts. There are sessions for those just getting started … as well as for seasoned professionals. Most sessions are 20-to-30-minutes. Discover how top producers get leads … how they run successful seminars … how they get the most return from their direct mail … and how they convert prospects into clients. See the titles for all available videos – click this link now. 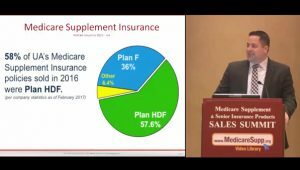 2018 Medicare Sales Summit – – click this link now – for FREE access. The regular cost for a full series of videos (such as the 44 sessions from the 2018 Medicare Summit) is $79. Enter the Coupon Code 60now when placing your order and you will save $60 (cost for a complete conference will be $19). The Coupon Code box will appear on the Check Out screen. Enter 60now. Be sure to click the Apply button. You will see the discount applied. STEP 3. ORDER ACCESS NOW You’ll get immediate access to watch. There is a 1-time charge (charge from the Recording Company) giving you 1 year of 24/7 access for each series (example: all 47 sessions from the 2018 conference). Watch some now … watch some later. Watch them more than once. It’s the next best thing to being there! See the speaker and their presentations on any device with Internet access. It’s the next best thing to having attended these national Medicare Supplement Sales Summits. You’ll see the speaker as well as their presentations. To get started – click this link now.